Remeber the Pay Day and Snickers candy bars...need I say more? A whopping 3 1/2 LBS. and made to order...Please allow at least 1 week lead time for this dessert as it is "NOT" and "IN STOCK ITEM"! We do not keep this dessert in stock because the peanuts tend to become soft when manufactured in advance and we want you to have the best dessert possible! This dessert is a cross between a Payday candy bar and a Snickers. How good can it get….really, good. This palate pleaser begins with a layer of caramel and fancy whole salted Planters Peanuts that have been topped with a layer of dark chocolate silk, a white chocolate silk mousse, dark chocolate ganache, more peanuts and drizzled with more caramel. 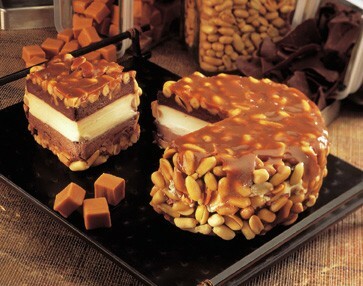 This is a must have for the chocolate peanut lover.